More than 100 Hotpoint, Indesit and Creda tumble dryer models manufactured between April 2004 and October 2015 could pose a fire risk, new Which? Research reveals. Two weeks on from news breaking about the Hotpoint, Indesit and Creda tumble dryer safety alert – and with the manufacturer still not listing the affected products that potentially pose a fire-risk – Which? research can reveal that 113 models of tumble dryer built during the affected period are included in the recall. This represents 80% of all of those made during this time. Find out which are the most and least reliable tumble dryer brands. With the manufacturer still failing to publish a list of models affected, we’ve compiled our own list. We researched this list using the safety.hotpoint.eu and safety.indesit.eu websites. The tumble dryer experts at Which? checked the model names of more than 140 tumble dryers made between April 2004 and October 2015. We found that 80 out of 93 Hotpoint tumble dryers produced during the period are included in the safety alert. Also included are 28 out of 37 Indesit tumble dryers manufactured in the same period and five out of 11 Creda dryers. Below, we’ve listed the tumble dryer models we’ve found to be affected by the safety alert. If you own one of these models it will need to be serviced and modified. Is your Hotpoint, Indesit or Creda tumble dryer safe? Check whether your dryer has a green dot sticker on the inside of the door towards the top, either on the door itself or the door rim. If there’s no green dot in these two areas, check the back panel of the machine in the middle and towards the top. If your dryer has a green dot sticker positioned in these areas, the manufacturer tells us that your machine is not part of the safety alert. If you don’t find the green dot, you’ll need to find out whether your dryer is affected by visiting either the Hotpoint or Indesit websites (safety.hotpoint.eu and safety.indesit.eu) or by calling 0800 151 0905. 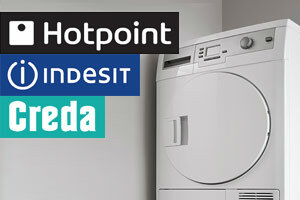 You can check Creda dryers on the Hotpoint site. You’ll need to have both the model and serial numbers handy. You will find the serial number inside the door-rim of your dryer on the upper right hand side. The serial number is found beneath the barcode and it’s made up of the nine numbers following, but not including, ‘S/N’. If your dryer is one of those affected by the fire safety alert, our advice is to contact the manufacturer to arrange a service and to not use it until it’s been serviced. It was announced on 23 November 2015 that a fault was discovered with some dryers manufactured between April 2004 and October 2015. The fault could lead to fires if fluff comes into contact with the heating element. Since then it has emerged that 750 fires featuring Hotpoint, Indesit and Creda have been reported since 2004, leading to three injuries. This list includes the 113 models of Hotpoint, Indesit and Creda tumble dryers that we know to be affected by the safety alert but there may be more. If your dryer isn’t on this list, call 0800 151 0905 or check online at safety.hotpoint.eu (for Hotpoint and Creda) or safety.indesit.eu to find out whether it is affected. STORY UPDATE 23/02/2017 – Read the latest on the Hotpoint, Indesit, Creda and Swan tumble-dryer fire risk alert. Whirlpool tumble dryer safety alert, what are my rights?